Last weekend, while staying at a relatives place in Milltown, i decided to get up early on Easter Sunday and head for Croagh Patrick. From reading all of the comments here i knew it was doable and that the upper 200m would e tough, nevermind the descent. Anyway i decided to give it a try, having climbed Caherconree and Bautregaum a few days before. I parked in the car park at Murrisk (Comment point A), making sure that i had 'Paid and Displayed' as the numerous signs requested! The weather was ok, a little cold and windy but i could see the summit clearly. The first hour took me up past the grotto and along a well worn track towards the saddle as mentioned by others here. 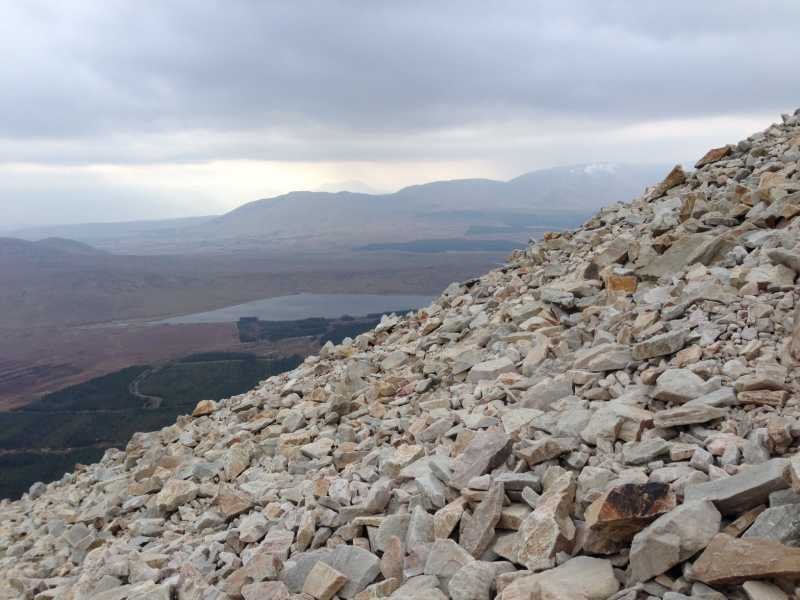 It was a fabulous section with stunning views over clew bay visible from early on in the climb. When I got to the saddle, the wind really picked up from the south and gave an indication of what lay ahead at the summit. I agree that the final 200 m are quite difficult, however good advice given here was to try and stick to the rocks jutting out from the ground and avoid the loose rock. Again, a walking stick is an absolute must and more so on the descent. This section was tricky in that the 40 or so degree field of view ahead and no sign of the church for a bit can spook you but to be fair once you concentrate on your steps, it's well doable. When i got to the top, the wind was extremely strong so i didn't hang around too long. A stunning view opened up over Clew bay and also to the South. The descent is not as bad as it may seem on the way up, just mind your step and use the walking stick.